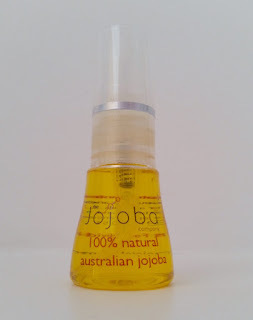 I've spent a lot of time discussing argan oil on my blog recently, but there is another fab oil that I think deserves some attention: Jojoba oil. Jojoba oil is close in molecular structure to sebum, the oily matter that is created in the sebaceous glands in our skin to "lubricate and waterproof" hair and skin. A large chunk of sebum is made up of wax esters, but as we age, we produce less of it, meaning that we lose more moisture from the skin. Jojoba oil is the only oil that is known to also contain wax esters, meaning that it acts as a great moisturiser for both skin and hair as well as helping to restore youthfulness to the skin. In addition, Jojoba naturally contains powerful antioxidants, Vitamins A, D and E and Omega 6 & 9 fatty acids as well as as being hypoallergenic. 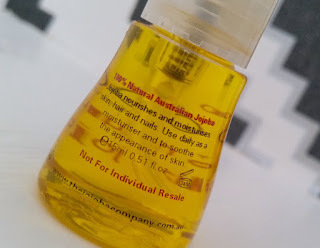 The Jojoba Company is an Australian company that produces jojoba based products, but they also sell pure, 100% Australian Jojoba Oil, which I'm going to be discussing with you all today. Just like argan oil, jojoba is incredibly multi-functional. Therefore, like in my InstaNatural Argan Oil review, I'm going to list the ways that I tested it out and what results I've had. I have been using The Jojoba Company's Jojoba Oil on my face as a moisturiser, applying it both on wet skin and dry skin. I think that it's down to a matter of preference which way you apply it, but I don't notice any difference in results. The oil absorbs into the skin fairly quickly and leaves a nice, subtle, healthy glow. It's also pretty good on blemishes. Overall, I find the Jojoba Oil to be soothing and hydrating on the skin as well as being lightweight. I applied the 100% Natural Australian Jojoba to my hair at night before going to sleep, washing it off in the morning. It took two quick washes to remove any excess oil, but my hair was left feeling soft and looking shiny. In addition, after using the oil on my hands (see below), I gently run my hands over my hair when it has almost absorbed into the skin. I don't have much success trying to apply more oil than that, but this method works for me personally to add an extra shine boost to the drier areas of my hair. I have tried applying the oil to my skin in the same ways as on my face: on wet skin and dry skin, again finding no real difference except that it spreads further on damp skin than dry skin. As with my face, it left a nice glow on the skin and it was left hydrated and moisturised. Rub it in between your hands first to gently warm it and it goes even further! As with the argan oil, this was the first thing that I tried upon opening. I used a couple of drops of Jojoba Oil and massaged them into my nails and cuticles, and then a couple of extra drops to massage into my hands. It absorbs really quickly into hands and nails, leaving them well moisturised. Also, because it absorbs so fast, it is more ideal to use whilst out and about over argan oil. However, I don't find that it is as moisturising as argan around the cuticles. To use as a lip balm, apply a couple of drops of oil to your fingers and gently apply it to the lips. This leaves the lips feeling softer and more moisturised - perfect for the colder weather. It also works wonders on dry patches too! With this one, I prefer using the Jojoba Oil over argan oil as I personally think that it works better as a lip balm. It lasts longer and helps to reduce dry patches far more quickly. 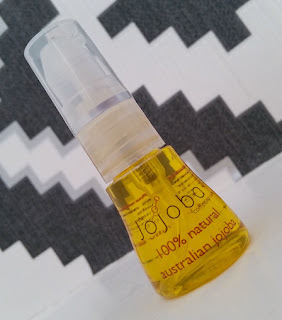 Overall, I really like this little bottle of 100% Natural Australian Jojoba! It's another fab addition to anybody and everybody's toiletries collection thanks to it being so multi-functional. Every member of the family will be able to use it and benefit from it in some way. You can purchase The Jojoba Company's 100% Natural Australian Jojoba for £12.99/30ml or £19.99/85ml from Holland & Barrett, or from $19.95 AUD at The Jojoba Company's Australian website. What are your thoughts on The Jojoba Company's 100% Natural Australian Jojoba? Which oil do you prefer?